Health care directives, medical power of attorney, advance directives, and living wills are instructions that specify what sort of medical treatments you would like to receive in the future if you cannot speak on your own. Your physician will decide whether you are too ill to make decisions for yourself. In Maine, the standard form is divided into several parts. The first asks you to name a health care agent to make treatment decisions for you. The agent will be able to make almost any treatment decision for you. This includes decisions regarding tests, medications, surgery, life-sustaining treatments like mechanical breathing and artificial hydration, which facilities to admit you to, and whether to administer IV fluids. 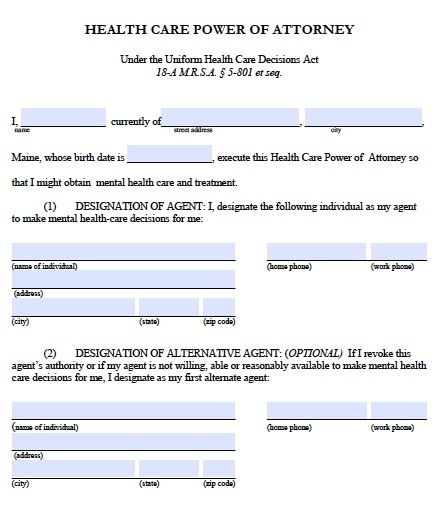 You can also write on the form specifically whether or not to be kept alive artificially if you have an illness that is terminal and will result in death quite soon, or if it is very likely that you will never regain consciousness, as determined by your doctor.